Not all of these mining operations involved crushed rock, which is a significant source of acid rock runoff. (Acid rock drainage can result from any sort of excavation work, including road construction.) Nor do all of them involve other surface and groundwater contaminants, such as arsenic and selenium. However, many operations undoubtedly involve some type of environmental impact on the world’s waters. Acid rock runoff or acid mine drainage requires treatment because, untreated, it makes water uninhabitable for aquatic life. Contaminants such as arsenic and selenium can occur in both acid mine drainage and mine-influenced waters that have a neutral pH, depending on local conditions. In both cases, these two contaminants also require treatment. Why Do Waters Containing Arsenic and Selenium Require Treatment? Arsenic is a metalloid that occurs naturally in many minerals, especially minerals that contain sulfur, which is also a culprit in acid rock runoff. 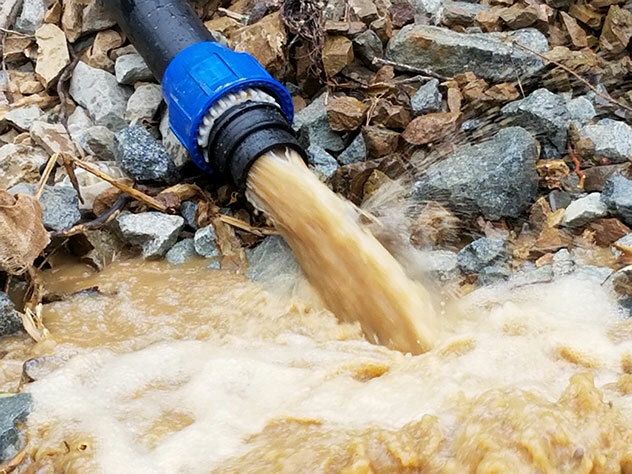 For an in-depth look at the problems associated with, and remediations for, acid rock or acid mine runoff, see our two blogs on the subject: Low TDS Acid Mine Drainage Wastewater Treatment and Acid Mine Drainage Treatment. Arsenic is, unfortunately, a common groundwater contaminant. Water and wastewater that contain arsenic require treatment because it is toxic to animals that, and humans who, ingest it. Selenium is a metal that normally occurs in minerals, especially minerals that contain sulfide, an anion of sulfur, along with copper, lead, silver, and nickel. Selenium in water and groundwater requires treatment because in high concentrations, it can cause selenium toxicity. To render arsenic- and selenium-containing waters safe for humans and the environment, the U.S. Environmental Protection Agency (EPA) specifies treatment to levels of arsenic that are no higher than 0.010 milligrams per liter (mg/L) in drinking water and levels of selenium that are no higher than 0.05 mg/L in drinking and raw water. Organizations can treat waters containing suspended or dissolved contaminants such as arsenic and selenium using either sedimentation or filtration technologies, or both. Sedimentation technologies are generally indicated for clarifying water that contains suspended solids. These technologies rely on chemicals that coagulate contaminate particles in floc. The floc then settles out of the water, creating a sludge. Filtration technologies are generally applied for treating waters that contain dissolved chemicals or minerals. Filtration systems involve passing waters through filter media that trap contaminant particles. These systems include media filtration or size-exclusion based separation – such as ultrafiltration technologies – to remove suspended contaminant particles. Dissolved contaminants can also be treated using technologies such as nanofiltration and reverse osmosis. WesTech provides sedimentation and filtration solutions for mineral applications worldwide, offering everything from specialized equipment to turnkey systems. It has the expertise to deliver customized solutions that are cost effective and reliable. CONTRAFAST® technology is among the many offerings that WesTech provides for organizations that require sedimentation solutions to treat raw water and wastewater. CONTRAFAST is high-rate clarifier and softener technology that combines clarification and sludge thickening in a single operation. It has a footprint that is 25 to 50 percent smaller than that of a conventional clarifier alone, making it a good choice in locations where space is an issue. It can run at rise rates that exceed 1.38 cubic meters (m3) per hour per 0.1 square meter (m2) – 6 gallons per minute (gpm) per square foot. This is over 12 times the hydraulic loading rate typically used for conventional clarifiers. 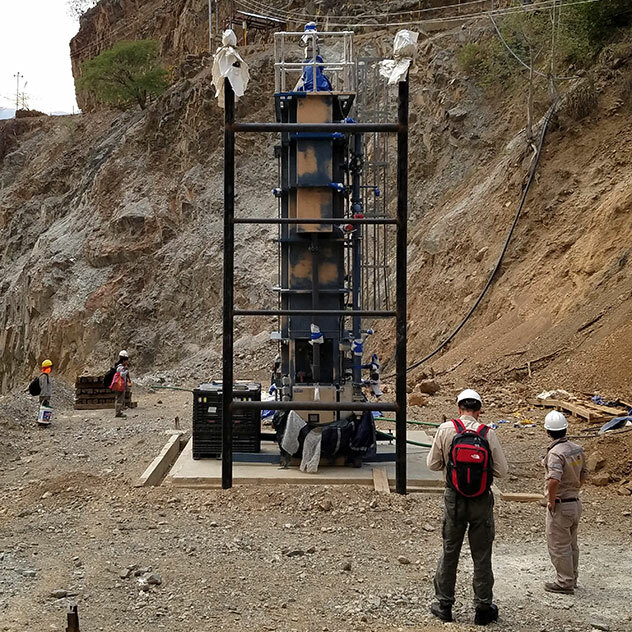 A recent project in Peru demonstrates this technology’s effectiveness. 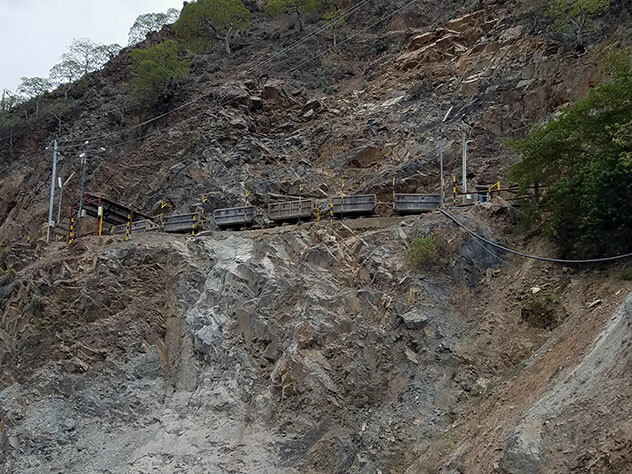 A mining organization located on the sides of a deep valley needed an effective way to treat mine runoff bearing arsenic levels that, when disturbed, spiked to over 500 mg/L and turbidity spikes that exceeded 101 NTU. To meet government regulations, the company needed to reduce arsenic levels to 0.08 mg/L and total suspended solids (TSS) to below 25 mg/L before releasing the effluent into a nearby stream that flows into the headwaters of the Amazon River. The company’s current, less efficient sedimentation solution involves adding an anionic polymer and ferric chloride to the water. The resulting reactive chemistry coagulates the arsenic in a floc, so when the company sends the contaminated mine runoff to holding ponds, the arsenic and other solids settle. The company then sends the clarified water to the nearby stream and transfers the sludge from the holding pond to an evaporation pond for drying. As a final step, it disposes of the sludge cake in a lined land field. WesTech engineers recommended a CONTRAFAST® pilot plant to demonstrate how the company could improve both the efficiency and effectiveness of its water-treatment process. For the pilot study, WesTech engineers diverted ground water past the company’s ponds. It pretreated the influent with ferric chloride for arsenic removal and anionic polyacrylamide to assist rapid settling. The pretreated influent then entered the CONTRAFAST Flash Mix Tank for initial flash mixing. From there, the influent entered a center draft tube for high-rate downflow recirculation, followed by an internal reactor section for upflow recirculation. 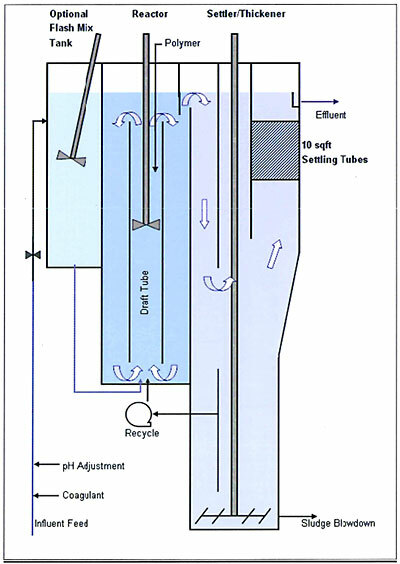 After passing through a downflow transfer zone, the influent entered the CONTRAFAST settler/thickener area, which includes a 1 square meter (m2) – 10 square foot – area containing settling tubes set at a 60-degree angle. The treated effluent flowed from the top of the CONTRAFAST tank. An external sludge recirculation pump returned a percentage of the conditioned solids back into the raw flow stream and a scraper mechanism diverted the remaining solids to a center sump with intermittent blowdown. The company used the CONTRAFAST pilot for 19 days to evaluate the technology’s effectiveness. 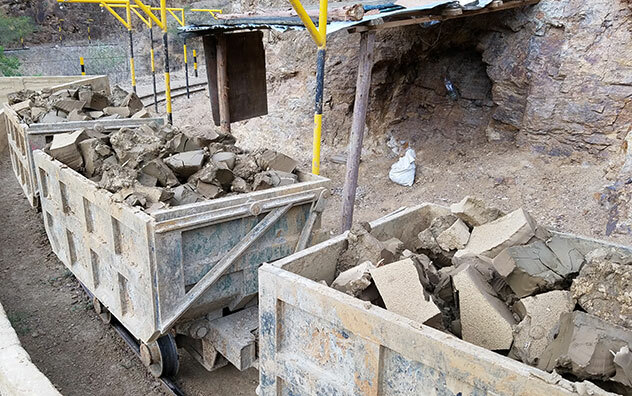 During this time, WesTech engineers were able to determine the optimal ferric chloride and polymer dosage rates for arsenic removal and rapid solids settling, respectively. They were also able to determine the technology’s hydraulic performance and gather sludge-characterization data. Additional instrumentation – including flow meters, a pH sensor, and chemical test strips – facilitated water-quality control. The pilot plant proved CONTRAFAST technology to be an excellent solution for treating water under varying influent characteristics and flow rates. It reduced arsenic content to an average of 0.0459 mg/L and consistently clarified effluent turbidity to average TSS levels of 5.33 mg/L. WesTech has a wide range of filtration solutions for removing contaminants for which standalone sedimentation systems are not ideal or sufficient to meet treatment targets – including multimedia filtration and membrane filtration. For Smoky Canyon Mine, which is located on the Idaho-Wyoming border, a contaminant of concern was selenium. To meet stringent project-specific requirements, the ideal method for treating this contaminant was membrane filtration – specifically, low-pressure ultrafiltration followed by high-pressure reverse-osmosis filtration. For this project, WesTech engineers recommended a full-scale, 2000 gpm, open-platform VersaFilter™ ultrafiltration system as pretreatment to remove suspended solids in the selenium-bearing water, followed by a reverse osmosis system to reject selenate to below the 5 microgram per liter (µg/L) levels that the EPA requires. 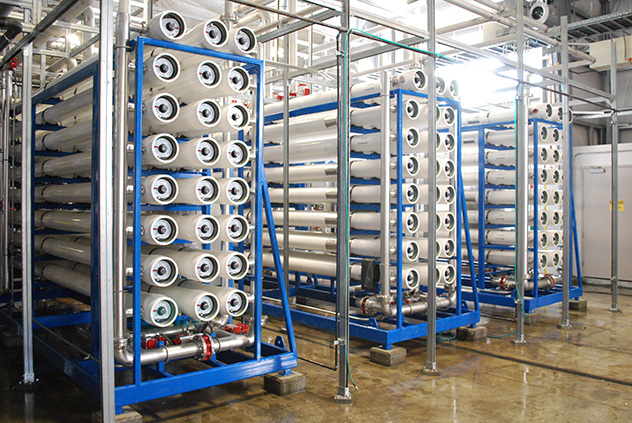 Ultrafiltration technology is a reliable method for producing high-quality process water. Using an efficient design and a small pore size, which ranges from 0.01 to 0.1 micrometers (µm), the VersaFilter system can reliably remove microbial and viral pathogens, suspended solids, turbidity, particulate metals, and coagulated organic matter. After the VersaFilter pretreatment, the filtered water is treated by WesTech’s reverse osmosis system. WesTech’s nanofiltration/reverse osmosis systems use semi-permeable membranes that reject high percentages of dissolved contaminants, including selenium, sodium, chloride, lead, and many more. Reverse osmosis has been shown to remove from 98 to over 99 percent of selenium and its various species, depending upon factors such as the water’s pH and oxidation levels. Selenate and selenite are the most common species in natural and mine waters. WesTech designed and fabricated the custom system to meet stringent footprint and operational requirements. The result? The level of selenium in Smoky Canyon’s effluent, which discharges into surface waters at Hoopes Creek Spring and South Fork Sage Creek Spring, is consistently below 5 µg/L. Both the Peruvian and Smoky Canyon examples highlight treatment options for a single contaminant. However, treating mine runoff and wastewater can be more complicated than this. For example, when groundwater seeps into mine shafts and then flows out to the surface through natural openings, organizations might need to treat waters for two or more contaminants. The resulting treatment process might then involve both sedimentation and membrane filtration. It’s important to remember that although treating mine waters might become complicated, it is certainly not impossible. WesTech Engineering Inc., engineers and manufactures water and wastewater treatment process equipment for power generation, mineral, and industrial applications worldwide. With broad experience in providing process equipment for diverse liquid-solids separation settings, WesTech’s process approach provides solutions for any water treatment challenge. WesTech is ISO 9001:2015 certified. For more information, please submit your question via the Contact Us form.